Have you ever invoiced someone on a Post-It note or a sheet of binder paper? But, it’s much better to put your best foot (or invoice) forward and showcase your business in the best light. Professionalism is key to any flourishing art business and professional reports are a fantastic way to display yours. Whether it’s a clean invoice or a polished portfolio page, professional reports are an easy and fast way to impress buyers, collectors, and galleries alike. And when they see you as the professional you are, they are more likely to treat you and your art business the way you both deserve. Here are 5 professional reports every artist should create. Artwork Archive Makes Creating Professional Reports Easy! While a Post-It note invoice does the job, it’s much better to have a clean, professional invoice to hand to a buyer. That way they know what they’re paying and when the money is due. And you know you’re getting paid what you deserve. You want your invoice to contain your contact information and the client’s contact information for easy correspondence. 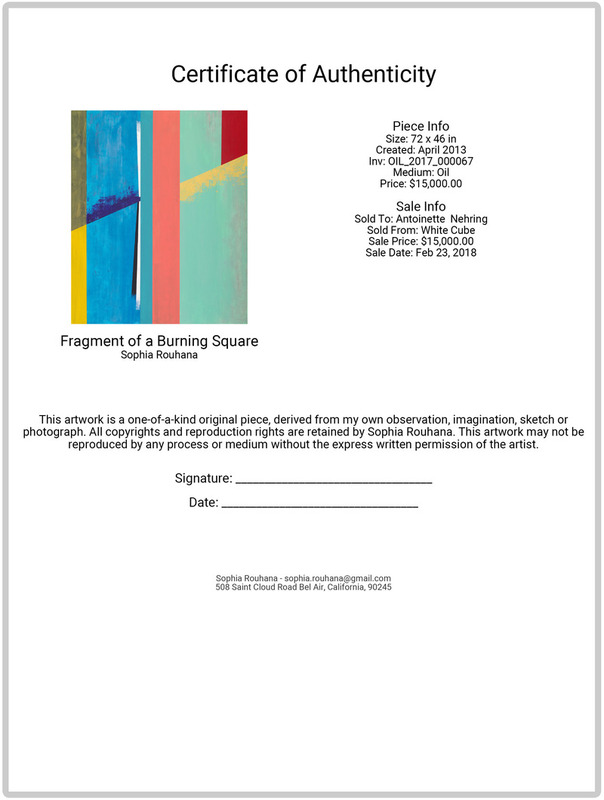 It should also have an image of the work, it’s title, dimensions, and price so you both know which transaction is taking place. The price needs to be broken down into piece price, framing (if any), tax, shipping (if any), and down payment (if any). It speaks professional volumes to have all this laid out nicely and creates a streamlined, transparent experience for the buyer. Consider a consignment report an essential part of working with a gallery. It ensures the gallery has the exact information on hand about your artwork. They’ll know its price, dimensions, any notes you want to include, its consignment ID, and the date it was consigned. Your gallery will also have your contact information - and you’ll have theirs - so they can easily get in touch with you about your piece. Hopefully, it’s to tell you it’s sold! Example of an Artwork Archive inventory report. It’s so nice to have gallery labels available at the click of a button. You can easily print off gallery labels through Artwork Archive. You can choose to display your name, the title, dimensions, inventory number, price, and/or a description of the work. It’s as simple as that! You’ll be all set to impress at your next art show, festival, or solo exhibition. Who doesn't want to save time and showcase their professionalism? Printing custom address labels is one of those ways. With a click of a button, you can print address labels onto Avery 5160 Size Labels for any selected contact within Artwork Archive. It makes shipping simple and streamlined. Some of our artists keep a stack of portfolio pages in their studio. Then they can easily hand them out to any interested party that visits their workspace. 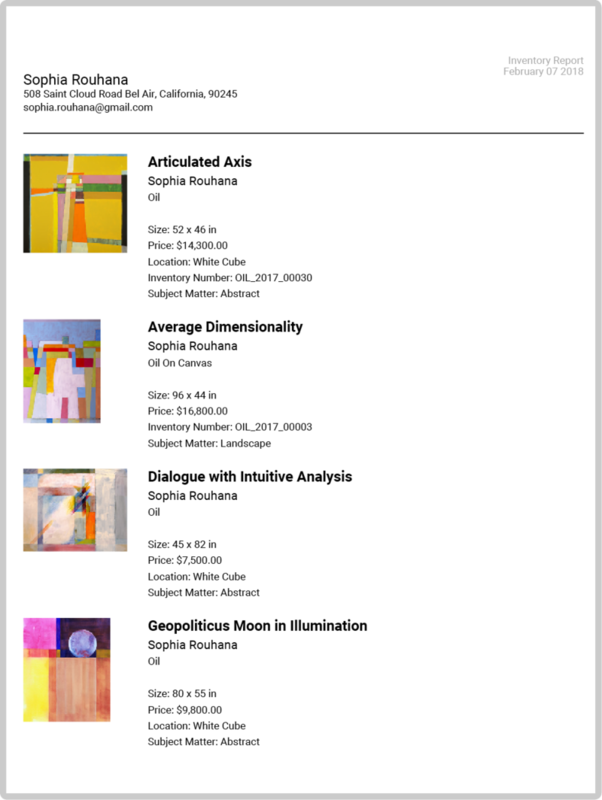 Portfolio pages are also wonderful and professional ways to show interested galleries and buyers what is available to consign or purchase. You can choose the information you want to share including title, size, artist name, description, price, inventory number, creation date, and your contact information. You can promote your work with a beautiful and informative portfolio page. Want to Organize Your Art Business and Receive More Art Career Tips? Get started for free here. Do you have a response ready for price-doubting art customers? Prepare yourself with one of these 5 smart replies. Gain inspiration and travel the world, without going broke. We found seven incredible (and partially-funded) international artist residencies. Instagram is a phenomenal platform for artists, but what and when do you post? Should you use a filter? What about hashtags? We’ve got your answers.